Phenomena of Optical Metamaterials provides an overview of phenomena enabled by artificial and designed metamaterials and their application for photonic devices. 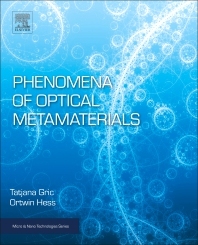 The book explores the study of active metamaterials with tunable and switchable properties and novel functionalities, such as the control of spontaneous emission and enhancement. Topics addressed cover theory, modelling and design, applications in practical devices, fabrication, characterization, and measurement, thus helping readers understand and develop new artificial, functional materials. Ortwin Hess holds the Leverhulme Chair in Metamaterials in the Blackett Laboratory Department of Physics at Imperial College London. He is Co-Director of the Centre for Plasmonics & Metamaterials and Deputy-Head of the Condensed Matter Theory group. Bridging condensed matter physics and quantum optics, Professor Hess's research interests and his group's activities are in Quantum Photonics and currently focused on active (photonic, electronic and magnetic) metamaterials, quantum nano-photonics and spatio-temporal dynamics of (plasmonic and semiconductor) nanolasers. The Rumford Medal 2016 has been awarded to Professor Ortwin Hess for his pioneering work in active nano-plasmonics and optical metamaterials with quantum gain at the Royal Society's Anniversary Day in November 2016. Tatjana Gric is an Associate Professor at Vilnius Gediminas Technical University and a Visiting Professor at Imperial College London. Prior to becoming an Associate Professor, she was a Leading Engineer of PCB design at AKIS technologies. She is on the Editorial Board for the International Journal of Research Studies in Electrical and Electronics Engineering and has helped organize the International Conference of Computational Methods in Sciences and Engineering.